Era anoche la fiesta de la Virgin Esparanza de Triana!!! It was a wonderful weekend spent hanging around Sevilla. Last week Raquel had invited me to join her and a group of friends for dinner on Saturday night at an Argentinian steakhouse. I was honored and super excited! Oh let me back track to Friday night…. I had decided to stay in and was soundly sleeping by 11:00. (Here in Spain dinner is served at 9:00. Even the older people eat anywhere between 9:00-11:00 at night). Than, all of a sudden, I hear very loud music (the type of music you hear at church), but with drums, and other loud musical instruments. Was I dreaming? The music continued to get louder so I jumped out of bed to see what was happening. All this noise was coming from the street below me! 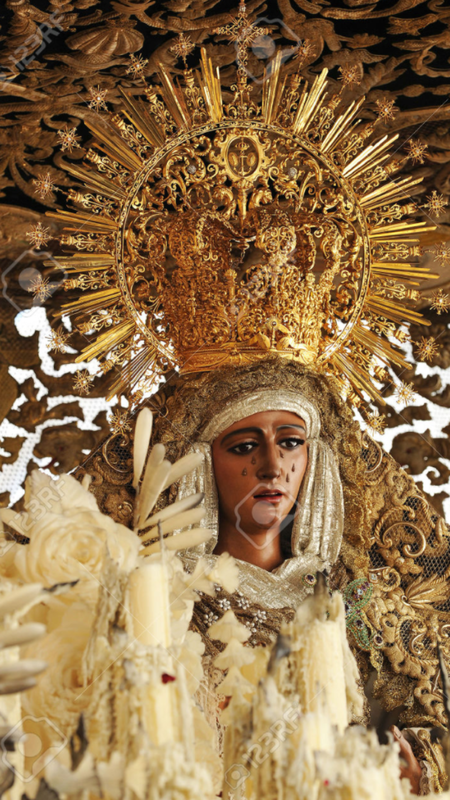 It was a procession for the Virgin Esparanza de Triana. Trianna is a part of town located in Sevilla, and is it where I live. Now here it was, 12:30 at night and a full blown parade was marching down the street! Amazing! These Sevilliano’s are AMAZING!! My mother gets angry if her house phone rings (well, all the time), but especially after 7:00pm. “Who could possibly be calling at this hour?! This had better be an emergency!”. And now here I am living in a city where there is a parade at 1:00 in the morning! I LOVE IT!! When Raquel and Manuel came to pick me up for dinner on Saturday night, I started to tell them this story. Raquel and I, of course, were instantly in tears laughing. They then proceeded to tell me that the Sevilliano’s are so religious and nothing stops them when they need to move a statue! Apparently, the moving of this Virgin statue was the sole purpose of the midnight parade. It had to be moved from one Church to reside in a different church of the opposite side of town. And, just as I started to fall back asleep my grillo’s (cricket) came out and started chirping! I am convinced that these Sevilliano’s crickets are of the most religious bread and were just as excited about the parade as I had been. Because, they continued to chirp the night away! !